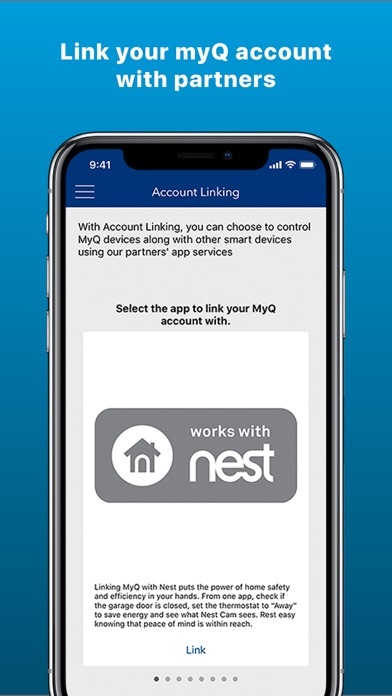 If you are a new myQ user – download the new “myQ” app that supports all of our brands and includes our most comprehensive feature set. 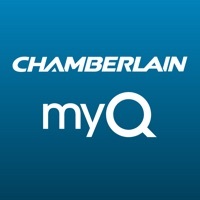 Chamberlain’s myQ-enabled products and myQ app allow you to easily open, close or check the status of your garage door or myQ home lighting from anywhere with your smartphone or tablet. Features: ·Set up real-time alerts that notify you when there’s activity with your doors or myQ lights ·Check the status and control your doors or myQ lights from anywhere ·Set schedules to close your garage doors or to have your lights turn on/off* For myQ smartphone control you need one of the following products: ·A Chamberlain Wi-Fi garage door opener ·A myQ accessory to upgrade a non-Wi-Fi garage door opener To purchase a myQ accessory for smartphone control, visit https://www.chamberlain.com/myq Chamberlain - giving you the power of access and knowledge. *Feature may not be available with the myQ Garage accessory. Too many software glitches... Love the ease of install and setup but operationally the system is hit or miss. Too often my unit fails to close on demand, or it inaccurately reports current status of my garage door. 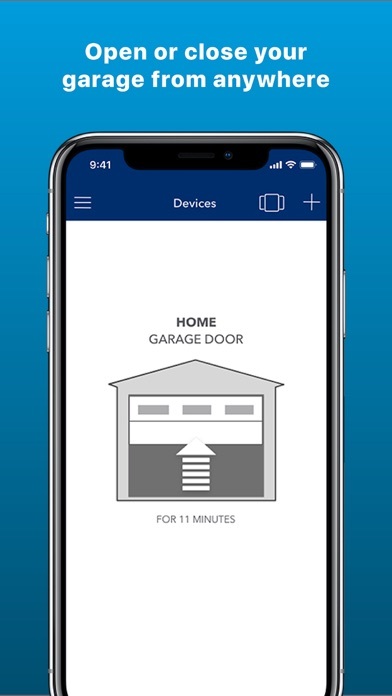 The new app is junk, it losses the password, it is reverts to old settings, don’t buy the product if you purchase this so you can use the app on your phone or to be able to use the other door openers to open/close the garage door. Great idea great product but it’s not 100% accurate and that scares me. 40% of time it notifies me door open. Three times in one month the door shut itself which is why I bought this product and yet the company said it shouldn’t do that. I say it should. 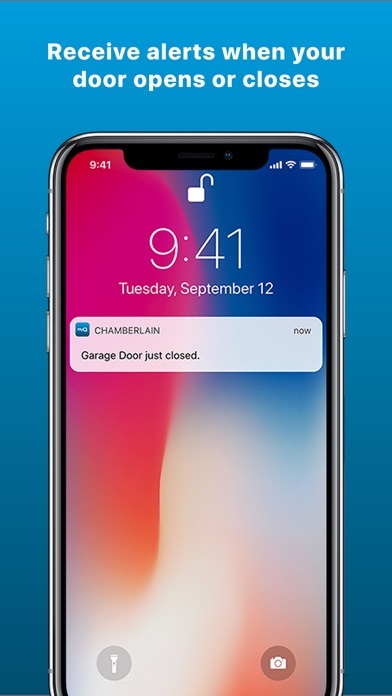 Have you ever considered adding an alert that will notify you when your garage door attempted to close but impacted something and returned to open? Nothing like waking up or returning home and finding the door did not close because of something blocking a sensor for example. An alert would be an outstanding addition. Please consider this in the next update. This is a great feature for your garage door opener. You can open your garage door from any where in the world. This is a great feature for teens to remotely get into your home without a key or for friends/family that don’t have keys... I’ve used it numerous times. Seriously, no Echo or Google Home support without paying a monthly fee? Who charges for this feature?! I have two garages, one at home and one at a rental property. I have set up the Liftmaster app for my tenants (and me) and the Chamberlain app for my family at home. This has been a simple and secure way to access each garage. If there will be only the one app available is there a way to download two instances of it? This was the worse upgrade ever it took over an hour just to get it back to working. Then when you try to add another phone it wants to go all the way through the install of the unit the is no option to add another users to the phone. Worst upgrade I've have ever had to deal with when you get ready I feel sorry for you!!!!!!!! 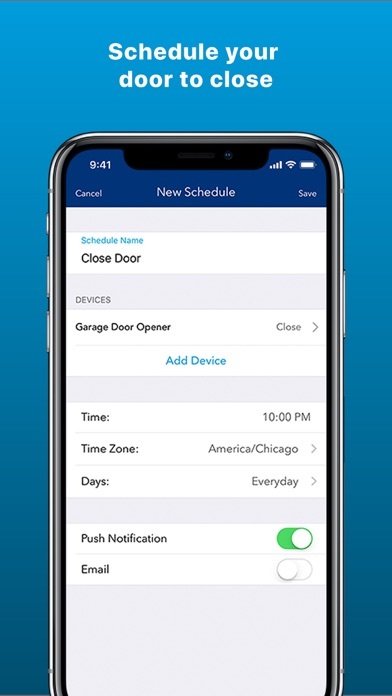 The app instructions to connect to garage door opener failed to work. After a chat with tech support on their website we got it to work. Had to delete gdo from craftsman website and enter the serial number manually into this app. It works now but like the craftsman app the complication for my Apple Watch doesn’t show up in any of the watch face options so that’s disappointing. I basically went sideways with this app. Ever since we downloaded the new app we have a failure to connect to the hub. Service has been terrible ..really terrible. I could no longer recommend this product.Several calls into customer service and all we do is reset soon after it fails again. Not sure why but anytime I control my garage door opener (open/close) from my phone app, it causes the physical unit to crash. I have to do a hard reset of the unit (get on a ladder, unplug from the ceiling, hold the buttons, and reset like a new unit setup) in order for it to work with the wall and mini openers again. So I don’t use the phone app and the reason I bought the WiFi unit as it was designed for but I sure would like to. The app is no longer reliable on the status of the garage door. Scheduled close has never worked. Keeps dropping any programmed devices. Always offline. Horrible product. Instructions in the app are worthless. After about the 5th time of leaving our garage door open when living on a semi busy street, I knew I needed something. This is perfect and super easy to install! Works exactly as described and expected. So quiet you don’t even know it’s working from the next room. Love the WiFi connection with alerts and the battery backup. All in all, a very nice upgrade! It’s been more than a month I am using this garage door opener in my new house and it’s working great. Mobile app is so convenient to use. I find the interface confusing and kind of slow. I preferred the old style - it was simpler to see what I was doing (open or closing the garage door). This might be beyond your control. It would be nice to have a CarPlay button. It would be great to do this right from my car. Doesn’t work reliably. Will sometimes open the door, but rarely closes it. I’m not happy with the new app. Matter of fact it is completely useless when it comes to opening or closing my garage. It doesn’t matter if we are on my home network or public WiFi. Don’t ask me to switch to something if it isn’t working 100% please. It’s constantly off-line. It tells me it cannot open the garage door yet, because of security purposes. (Whatever that means). It says, “I’ll work on that“, when you ask it to close the garage door, but it doesn’t close it. Just recently had someone break into my garage while I was at and my kids was home alone. I’m a single mom of four so this app gives me a little peace of mind when I’m not home. 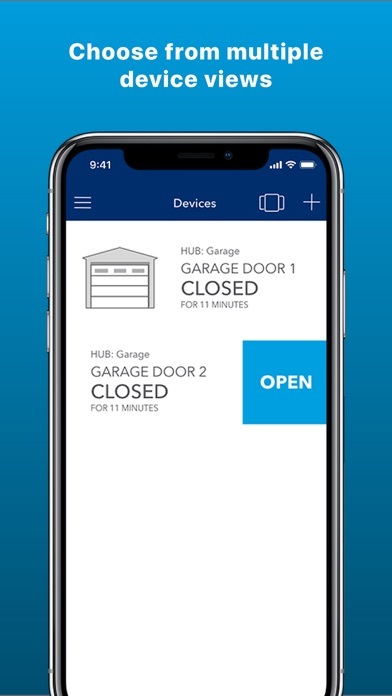 I can check this app anytime of the day, it lets me know if my garage is open, and how long it’s been open and close. Thank u! Did the update. Everything worked fine yesterday. One day later no access. Says to change my password. Could not access on the app. Logged in on my computer the error message changing password. Maybe you should trouble shoot updates before releasing them? Excellent garage door opener: quite, clean, reliable, and advanced. The connectivity to WiFi is great. While it can be a bit faster to open and close, it is pretty reasonable. With the new migration to the new app, is it mandatory? Or can we continue to use this app? I am updating my review, because I think I have finally figured out what causes all of the lockup and freeze problems I have had with this app. If, when opening or closing the door, I leave the app open until the open/close process completes and the status changes to “open” or “closed”, the app doesn’t seem to get stuck with the wait swirl on launch. I had been pressing open or close, and closing the phone once it started. Seems like this would hardly be an unusual way to use the app, but there it is. I find this system to be extraordinarily unreliable. Wind blows too hard against my garage door and I’ll get an alert that the door just opened. Or the sensor gets stuck occasionally and tells me I left it open when I didn’t. I try to close it from remote in those situations and then it tells me it just opened (what?). So then I try to close it again since apparently the sensor was wrong and it wasn’t open in the first place, but now it is. Then it locks me out saying there have been too many attempts to operate it and I need to close it locally. Great job guys - so now I just opened my garage door and I can’t close it from remote. Not great when you’re at the airport waiting for a flight. Have to call a friend or relative to go to my house to close my garage door. Really bad system and I no longer use it. Many issues with closing our garage doors! Does not always work! Also constantly changing the configuration on my phone, one days is one screen, next day is something different. Not getting doors opening or closing notifications any longer, I did not change settings. Thank you for listening! Great app!! Peace of mind finally!! The app connects to the hardware about 5% of the time. Not a WiFi signal problem. Yes, I have reset the router and opener. Terrible. Unclear whether this is an app problem or a problem with my new $300 opener. I downloaded the app, found my serial number, tried multiple times to enter. “Serial number not found”. Mine mfg’d in 2014. No letter in the serial number. Never had much luck with smart home items outside of hue bulbs by Philips which always work. This sometimes works. Not a very helpful gadget. Didn’t replace my need for programming my Homelink buttons in my car, or using my CodeDodger remote. I have the overhead door odyssey 1000 and overhead door Python 2 garage door openers. I’d pass on this product and the app if you have these openers. App locks up and fails to connect 70% of the time I try to use it. Should have brought a cheap garage door opener. Got this was excited nothing but problems. App hasn’t found my doors in 341 days. So painful. The My Q system is super great . This is my second home with a MY Q garage system. I love the alerts on both cell phones and when I’m up the street asking myself “ Did I close the garage door “ , I can quickly check and if I did leave it up , it’s simple enough to close it from my phone . It’s great that I can let service people in my house and not have to be home . Didn’t work for my LIftmaster MyQ. Waste of my time and no meaningful support. App works great with my unit. Wish an app would become available to be used in Chevy my link downloaded from the Chevy marketplace. That would be over the top for me.